This year almost every big and popular smartphone company we know has already gone dual camera either on the back or front panel. However, there is this one electronics giant that surprisingly stayed with single-lens set up with their flagship smartphones - Samsung. Samsung electronics launched the new Galaxy S8 and Galaxy S8+ a couple of weeks ago and while there were rumors months before that at least one of them would have dual camera sensors, that did not happen. But according to these latest leaks surrounding the devices, the Galaxy S8+ variant almost had that two cameras on the back. 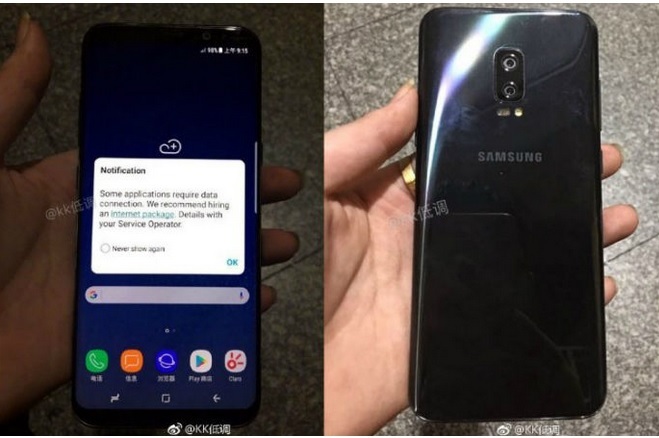 A Weibo (Chinese social media) user called KK posted a couple of photos showing the Samsung Galaxy S8+ prototype wielding a dual camera setup on its back. Why it did not come into reality? According to some reports, Samsung was not yet satisfied and happy with this kind of implementation on their flagship devices. But now that it's definitely confirmed that Samsung is already working on dual camera technology, it is mostly likely to appear eventually in their upcoming smartphone offerings, one of the best candidatea right now is the Galaxy Note 8 which is expected to be launched later this year. The image above tells us one more thing that seems to confirm one of the previous rumors (did not happen either) about these Galaxy S8 series. The Fingerprint scanner being inside the display itself. The photo shows it is not situated on the back close to the cameras, so this could mean that the fingerprint reader is embedded right underneath the display panel. This is one of the rumored features before, that Samsung and Qualcomm have created a new technology that would allow the display panel to house fingerprint scanner. But as you may have already know, the final Galaxy S8 and S8+ devices do not have this screen-embedded fingerprint scanner and instead it is awkwardly placed right beside the camera module on the rear.